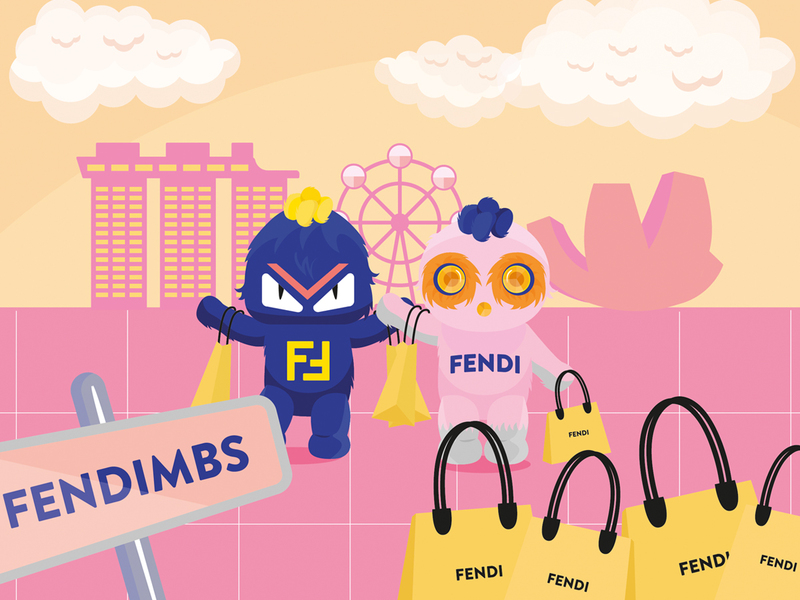 In case you haven’t already heard, Fendi’s cutest furry duo yet, #Fendirumi are in Singapore now, taking in the sights and celebrating the newly-revamped Fendi boutique at Marina Bay Sands. With different ‘rooms’ within the store dedicated to RTW for men, women, furs, bags, shoes and even accessories, the boutique also houses a beautifully ‘spiked’ wall, make of up of countless metal prongs that together form a stunning backdrop of Fendi’s most IT bags. And then there’s Bug-Kun and Piro-Chan (Bug’s blue while Piro is pink) who will be hosting their own meet-and-greet sessions at the new store from today till 27 November 2016. Yes, if you want to get up close and personal with the fantastic furry duo (and check out the new store at the same time), here are the timings you should take note of. For today, it’s 11.30am, 12.30pm, 1.30pm, 2.30pm, 3.30pm and 4.30pm. For 25 to 27 November, the Fendirumi will be looking adorable and be at #FendiMBSevery hour on the hour from 3pm to 8pm. Take a photo (or two), and while you’re there, shop up a storm and bring home your very own Bug-Kun and Piro-Chan in the form of furry bag charms, because you get fur-get about trying to kidnap the mascots and bringing them home. The mood at Fendi this Fall/Winter 2016 season was upbeat, less intellectual, and overall cheery. That showed in the mishmash and gleeful way the clothes were layered on and over-decorated. Some pieces had so many design details that they came jarringly close to looking fussy. The strongest points for Fendi this season, instead, were the simple gestures of a modern silhouette with some fur thrown in – an idea and a token, but ultimately an affirmation of what the brand does best. For a Fall/Winter collection, there was actually a lot more lightness to the collection than one would expect from a house known for fur. An arts and craft approach lent the clothes a vibrant color story and playfulness. Hems of skirts were ruffled and fluted, as were high socks and the undulating layers on shoes. Graphic curvy stripes come on in waves. But Lagerfeld, long-time designer of ready to wear for the house (he’s been there 51 years), is never one to over-intellectualize – so perhaps the ruffles were simply an outpour of passion for a younger, frillier girl. The namesake family designer at the house, though, is best at accessories. We saw Silvia Venturini Fendi continue her embellishment game with her bags. The Peekaboo, 2Jours, 3Jours, DotCom, By The Way and the unmistakable Baguette were given adoringly light-hearted treatments of sequined embroidery, fur appliqué, and a mix of marquetry and studded leather straps. They were a vibrant refreshment that positioned bags as collectable objects of whimsy and desire, not just stale leather goods to be considered for their investment value. It was hard to ignore the DotComs and By The Ways that featured smooth leather ripples over a suede body, and equally hard not to fall a little in love with a teal Baguette with great big tiered ruffled leathers erupting outwards. But the real gasp and coo moments from Fendi this season were the furs – duh. A great big furry bag – appropriately named Teddy – was paired with a spotted and striped intarsia fur coat. In other coats, the intricate intarsia technique was used to Japanese effect with delicate ikebana floral motifs. The impression made by such full-fur pieces is astounding, of course, when the cost and craft is considered – but they can easily strike an excessive note. Two looks encapsulated the ideally stylish and modern use of fur. On Lineisy Monteiro was a wide, A-line quilted parka with a textured fur collar – worn with beautiful double-faced denim trousers. On Imaan Hammam, a white and green roll neck was worn under a lightly pleated and oversized dinner jacket with a matching fur stole over a shoulder. The effect was effortless and aspirational, a real synthesis of heritage and currency.